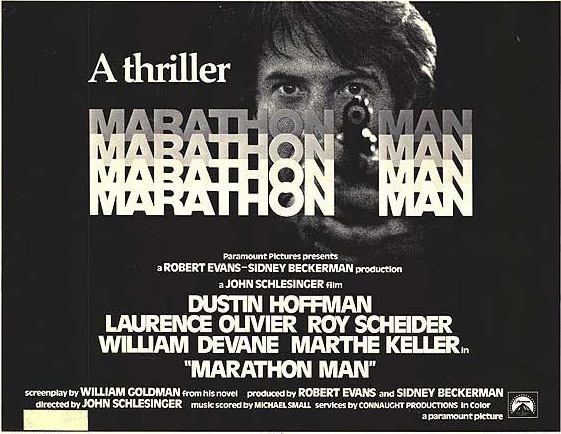 Ok... so maybe not a "thriller", but I have to say my first marathon on Sunday was certainly an experience!! 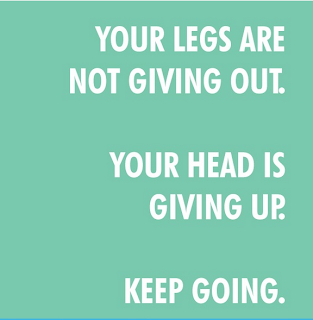 Since Sunday it keeps hitting me that I just ran 26.2 miles! I don't know that it's really sunk in, but I keep getting congratulated, so I'll go with it! It's really cool to know that I'm in the .5% of the US that has run a marathon. I really didn't know what to expect from the race, which made it exciting and scary at the same time. By the time race day came, I was so done with the lead up, I just wanted to get out there and get running! So, for those of you interested... below is my race report... I'll try to stick to the highlights so you don't fall asleep! We arrived in San Diego Thursday night, and surprisingly enough, we had rain almost constantly up until race day on Sunday. When we got to the start on Sunday, it was still very misty and sprinkling, with temps around 53F. The forecast was for it to clear off a bit that day and not rain. I couldn't find the 5 hour pacer, so just settled in near the back of the pack, a bit behind the 4:45 pacer. We started off in the dark, but it didn't take too long for the sky to lighten and the rain to stop. The pic above was somewhere around 5.5-6 mi, just as the course turned East to head up Palomar Airport Rd. I was feeling really good here.... On pace to finish right at 5 hours. I was glad the sun didn't come out til close to the end of my run, as it was plenty warm for me! As you can see, from mile 6 up to about 9.5 is straight up that road, and it was a decent climb all the way. Normally, a hill like this of that length would slow me down quite a bit up here at altitude. I would probably even speed walk parts of it. But this is where, in retrospect, the low altitude came back to bite me. My lungs felt great, so I kept on my pace, maybe even a little faster as I made the climb to 9.5 miles.. On the way back down I began to feel twinges in my right hamstring, glute, and ITB. I didn't push it faster on the way down, but at that point I think I had pushed my legs harder going up than I ever did in training, just because I didn't have my lungs shutting me down earlier and making me slow down. By this point, I had at least gotten back to knowing I was going to finish this thing, and finish before the cutoff and getting relegated to the sidewalk!! What was also interesting was that between 18-21 there seemed to be a lot of shuffling/walking wounded like myself... in one section it reminded me of a zombie movie the way we were all listlessly moving forward! But after getting a great boost and cheer from my wife Caroline, and my friend Lorraine (who drove several hours just to cheer me on! ), I decided enough was enough and I was going to finish this thing strong..
As I approached miles 22-23 I looked at my watch and realized that I still had a shot at making 5:30. This surprised me as I had written that off a while ago. I kept on pushing hard, but at this point the rest of the leg fatigue began to catch up with me. My feet were getting tender, and my legs heavier so it was harder to keep the cadence up. I do have to say though that the B2R Road Performance shoes were awesome.. combined with some new Injinji 2.0 toe socks (review coming), I had no hot spots, blisters or any foot issues other than just plain fatigue. When I got about .4 from the finish, my friend Lorraine popped off the sidewalk to join me. She told me how close the time was and wanted to help me get there. That was an awesome boost, and helped me dig down to see what was left.. If you see the guy just behind me, we had been going back and forth for the last 6 miles... with him being way ahead several times. I decided there was no way I was finishing behind him.. I came across the line with an official time of 5:33:09. Missed it by that much! I really had hoped to break 5:30 so I could enter the Pikes Peak Marathon this year, but honestly, I was not that upset. I gave it everything I had, and I was happy with that. And, I learned a lot in the race... all good lessons I can apply to my next outing. After having such a rough time in parts of this race, the thoughts in my head after crossing the line were all about doing another marathon, and doing it better... and looking to run even longer races. Crazy.. I know.. but I know many of you can relate. 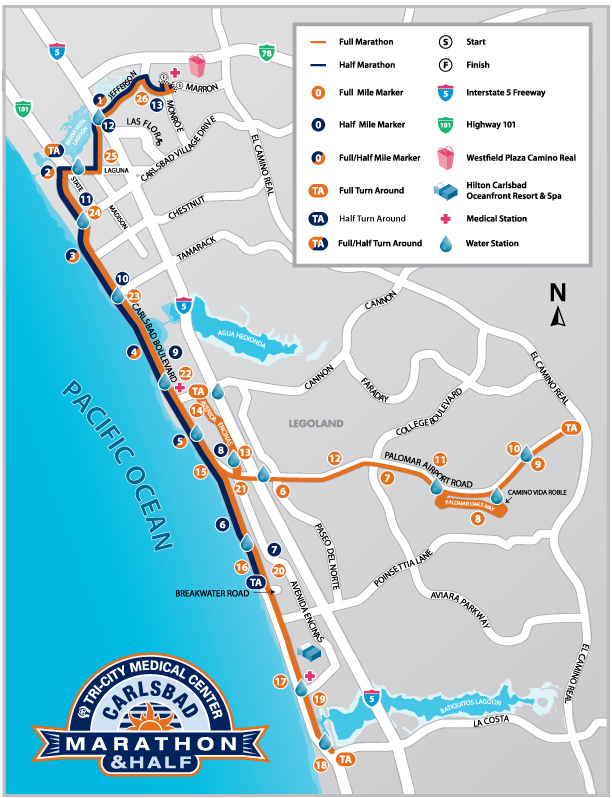 I know I don't have other marathons to compare this to, but I thought this was a well run event, with tons of amazing volunteers. The aid stations were well stocked and the course laid out well so I had no question as to what my route should be, even in a haze. Great music from live bands along the way as well! I really liked the marathon finisher's jacket as well... cool stuff! And we have some rock star friends at home too! Came home to find this on the door, plus balloons and other decorations... so cool!! Anyway, recovery is going well... was a bit hobbly on Monday, but today I'm feeling really good... just a bit of fatigue in my legs, but no permanent injuries from the race which is great. Still on the 120 day running challenge I started on the first, so grabbing at least 1 mile every day to keep that streak going. 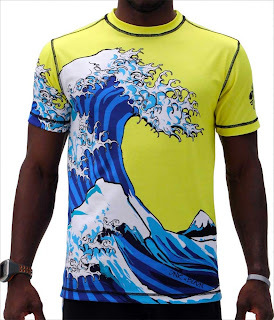 I also have to give a shout out to INKnBURN for providing the way cool tech shirt I ran in... so comfortable, and I got a lot of comments on it during the race. And thank you Injinji for the amazing 2.0's that worked perfectly... look for full reviews very soon. 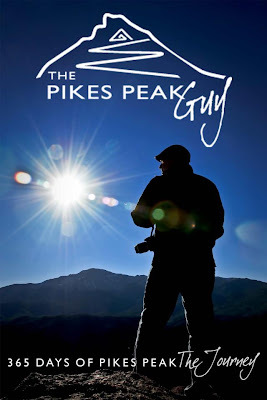 Thanks for taking the time to read about my adventure... and stay tuned to see what races are next, and a bunch of great reviews/giveaways coming up! Happy trails and have a great week! 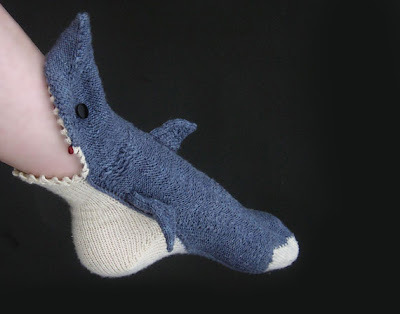 Socks & Sharks! Cool stuff happening soon! Ok... just had to get a blog post up about some really cool stuff happening soon!! 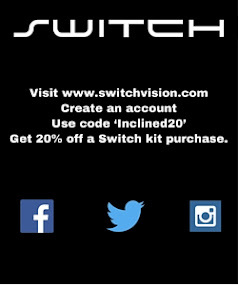 UPDATE 1-23-13: The website is up! Go to http://www.injinji.com/ right now and let me know what you think! 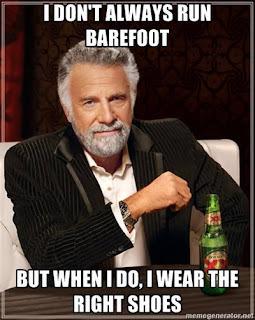 Either comment here, or better yet, on the FB page at http://www.facebook.com/pages/Barefoot-Inclined/212665608801909 I'm going to select one winner for a pair of the new 2.0s that aren't even available yet!! Injinji is poised to raise the standards and status of athletics’ unsung hero - SOCKS. With this toe-tally awesome video below, boasting Injinji’s weird and wonderful 5-toe sleeve design, you get a taste of what you can expect from the company as they not only bring Performance 2.0 to shelves, but launch an entirely new website set to go live Wednesday, January 23rd. AND... on the 23rd, I'm going to post up a quick contest from which the winner will get a pair of the new 2.0 series toe socks! The only thing you'll need to do is visit the NEW website ON January 23rd (not before), and let me know which socks you think rock... easy! So stay tuned on the 23rd. 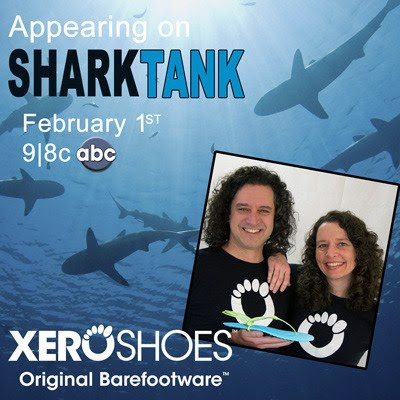 and NEXT... Injinji's work GREAT with Xeroshoes and I just heard that Steven and Lena Sashen from Xeroshoes are going to be on ABC's Shark Tank on February 3rd! The show is about entrepreneurs giving their best pitch to the "Sharks" to convince them to invest in their ideas, and Sashen & Co are going to give their best shot on the Feb 3 episode! How did you end up on the show? And how long did you pursue this opportunity? Lena and I had been watching Shark Tank for the previous 2 seasons. Then we watched the first season online, and tracked down video of the UK and Canadian versions of the show, called Dragon's Den. We spent our Friday nights, after a long week of work, watching and pretending we were the entrepreneurs pitching. We'd debate about the offers (how much equity they'd give up), the asks (how much money they wanted for the equity), the deals, and we'd pause the DVR to give the answers we imagined we would give if we were on the show. After enough people said to us, "You guys would be perfect for Shark Tank," we decided to apply. Getting on the show itself was pretty straightforward. If you go to http://abc.go.com/shows/shark-tank/casting, there are instructions about how to apply for the show. When I saw that they had opened the doors for applications for Season 4, I immediately sent an email with my story of why our barefoot shoes are so great, and why we needed to be on the show. I was told that the producers read every application (I hear that they got over 30,000 for this season), but I was ready to fly to one of the live auditions they were holding. Luckily, we heard back from the producers before I had to book a ticket. It seems you have a good business going, what/how are you pitching on the show? The reason we wanted to pitch was simple: Business has been great, with over 25,000 pairs of Xero Shoes sold to people in 87 countries. But an influx of cash and skill that the Sharks bring to the table would be a powerful accelerator. Plus, simply appearing in front of over 7 million viewers could have a dramatic effect on our business. What would this mean to Xeroshoes if it got the funding?? Half-jokingly, we like to say that our goal is to eliminate flip-flops from the planet. More seriously, we've heard from thousands of customers who've experienced the benefits of natural movement by wearing our sandals. 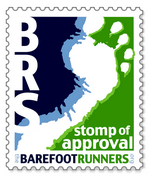 We want to help more people have those experiences, and have the fun of being as close to barefoot as you can get. We also have thousands of customers who love the look of our sandals, especially when they add beads and charms or use some decorative lacing style. We want to help more people have that kind of fun, too. 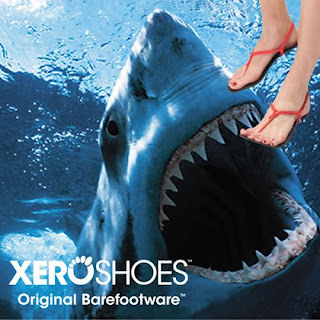 Plus, since we brought Dennis Driscoll into the Xero team (Dennis co-founded Avia footwear, which grew to $500 million, and most recently was the head of Global Product Design at Crocs), we have a number of new products we want to launch. Not surprisingly, it takes a significant amount of money to develop and produce those products and to make people aware of them so they can buy them and experience the benefits and fun they provide. We're doing well enough to bootstrap things, but we could speed up the whole process with funding. Regardless of what the outcome may be, how much of a boost does Xeroshoes get just by being on prime time? Call me a month after the show airs and I'll let you know! Too cool! Anyway, stay tuned next week for the Injinji launch, and be sure to watch Steven and Lena take it to the next level on Shark Tank! First of all, congratulations to all the winners from the Happy and Healthy 2013 giveaway, and a big thank you to all the great sponsors. That was so much fun, and I can't wait to do it again for 2014! Ok... so here's the long story. Saturday the 5th was my 2nd and last 20 miler on my training program. I was a bit nervous, even though I made it through my first one. 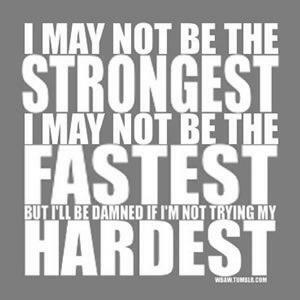 At the last minute, one of my FB peeps and and running idols, Mark Lofquist at Paleo Runners, left me a little quip for motivation. Basically he reminded me to keep my stride light and quick.. "pop pop pop!". Well, 4 miles into my run I passed by the "Venture Foods", a very small grocery store in the equally small town of Divide, CO. I needed a bio break (due to my pre-run coffee), and to warm up quickly, since it was 1F when I started my run. 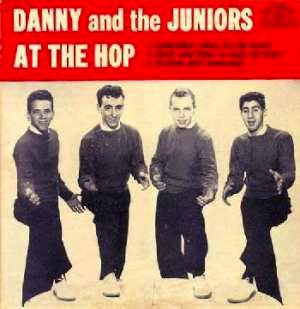 As I made my exit, "At the Hop" was playing in the store, and was subsequently stuck in my head. So, as I took off, this song was on permanent repeat for the next 16 miles, but of course with the lyrics changed to "lets go do the pop" .. and "pop pop pop pop pop"... goofy as it sounds, it sure helped. Thank goodness for the power of social media.. I posted that question up on a few of the running groups I am in... got enough feedback to understand my bigger issue would be overheating, and that I am going to be a ok in just shorts.. I know, silly things to stress about. So... any advice on coping with the next two weeks until the big day gets here? Or do I just continue find things to worry about like getting the flu, injuries, alien abductions and the like? I'll take all the advice and feedback I can get! Happy and Healthy 2013 Giveaway!! Hard to believe the year has already gone by! I started this blog in October 2011, and I had my first giveaway on 1/1/12 with the Happy and Healthy 2012 Giveaway. With a full year of blogging since that post, I can't tell you how much fun it has been. I've really enjoyed review and sharing running gear that I really like, and also doing what I can to share healthy eating related topics and recipes. And, I have really appreciated all of you that have been following my blog for the past year, following on Twitter, and liking the Barefoot Inclined Facebook page. Which is why I am so excited to host the ultimate giveaway on this first day of 2013, showcasing my favorite gear and vendors from 2012! And of course there is the running. I never dreamed I would develop a healthy obsession for running, but somehow that has happened. I credit discovering barefoot/minimalist running for a big part of that, as it helped me find a way to run with a lot less pain and injury. Not that I didn't have my share, but I've learned a lot over the year about prevention and training. Also, finding my love of trail running has certainly helped as well. There is nothing I enjoy more than just getting out on the beautiful trails (and Incline) in Colorado. In 2012, I started the year with a 5K as my longest race, and 5 miles as my longest distance run. During the year I ran several 10K's, a 10 Miler at Garden of the Gods, my first half marathon in August, and recently my long run of 20 miles as I train for my first marathon which is (gasp) less than 30 days away! My goals for 2013? Carlsbad Marathon in January, Greenland 50K in May (first Ultra! 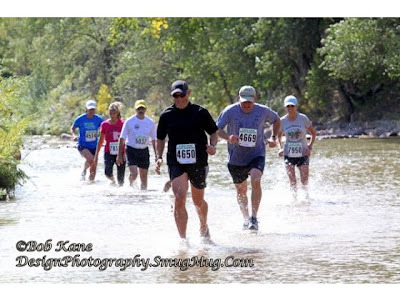 ), and the Pikes Peak Marathon in August (provided I qualify in Jan AND I can get an entry). Also, I want to build more barefoot miles, and run a 5 and or 10K barefoot this year. Beyond that, I plan to just keep trail running, testing/reviewing gear, and just plain having fun with it. SO.... Let's get this New Year started with a bang! The following is a summary/highlight of some terrific gear and websites I reviewed last year, along with some amazing swag provided by these vendors. I've had the privilege of working with some terrific people from equally great companies and I want to take a minute to thank them as well! In the following sections, you can click on the links for the products mentioned to see the full review I did earlier this year. In each section below, you are welcome to enter for any/all of the gear/products noted. The contests will run from January 1st, 2013 until 10PM MST on Tuesday, January 8th. A winner for each prize will be selected randomly from the entries received. Contest is open to residents of the U.S. and Canada. As you may know, my first pair of minimalist shoes were the Invisible Shoes 6mm Contacts. Still one of my favorite huaraches from a proprioception perspective, and also one of the most affordable running sandals out there! 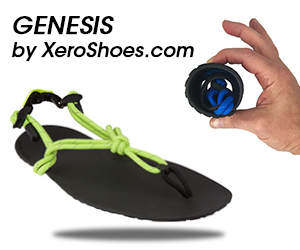 The company is still in the midst of transition to the new name Xeroshoes, but regardless of the branding, the quality is the same. I love working with Steven Sashen.. and his video (over on the left side banner) still cracks me up every time I watch it! Anyway, Steven has kindly offered to provide one winner with a DIY or Custom pair of Xeroshoes sandals in the style and color of their choice!! Thanks Steven! If you've been following my blog for a while, you'll know that Vivobarefoot makes one of my favorite cold weather snow running shoes, which is the Neo Trail. Check out my reviews for the Neo Trail and the Breatho Trail by clicking on shoe name. The Neo Trail was my first minimalist "shoe", and my go to shoe for snow running. The Breatho Trail offers a lot of the same qualities as this shoe, only better suited for warm weather conditions. Vivobarefoot is a terrific company with some amazing shoes. I'm looking forward to what they may have to offer next year! 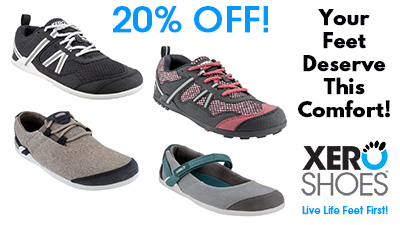 The great folks at Vivobarefoot will provide one pair of shoes to a lucky winner!! (THIS contest is OPEN to the UK!) 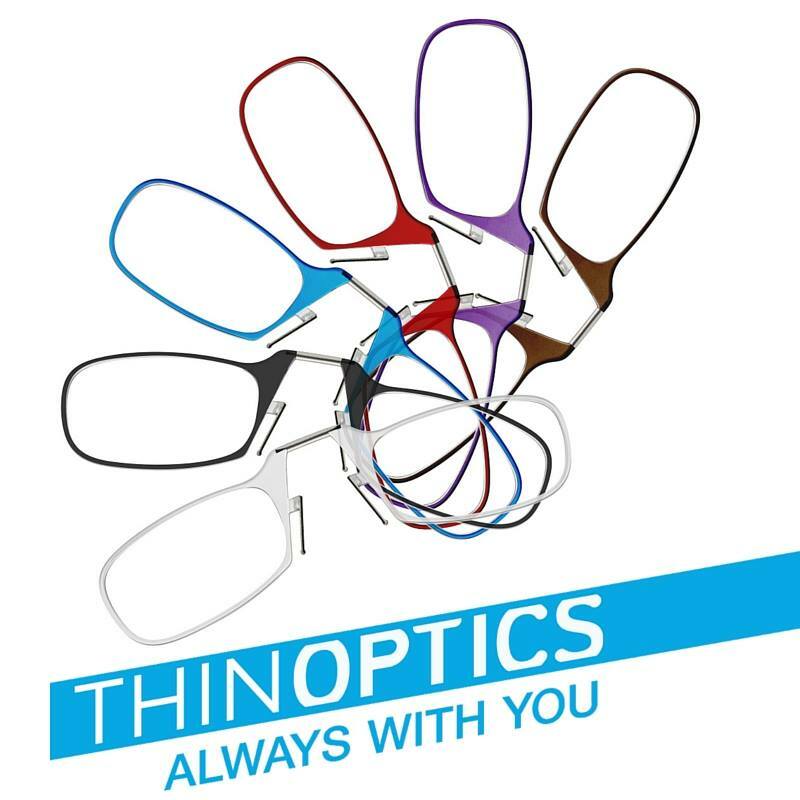 Choices may be limited by availability, so if you are the lucky one, decide on your top 3 choices with size and color! I don't normally run with earphones in, especially on the trail. But there have been times when I would like to. 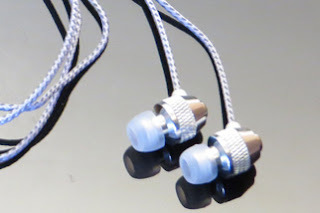 Earlier this year I tested out the "One Good Earphone" from Far End Gear. These were the perfect idea, as they allowed stereo audio through one ear piece, leaving one ear open to listen for traffic or wildlife etc. In addition to this product, Far End Gear also offers Brite Buds, which combine reflective cords for safety, plus increased strength and durability, available in single or dual earphone models. 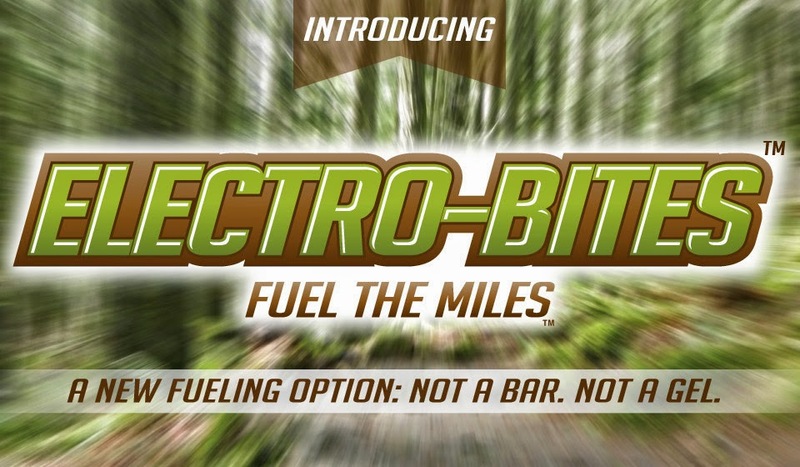 Far End Gear totally rocks, because they are providing Brite Buds for two lucky winners! Enter below!! One of the first resources I checked out when I started barefoot running was Michael Sandlers book, "Barefoot Running: How to run light and free by getting in touch with the earth". I love Michael's story, and the book is an excellent resource. What was really exciting was hearing that he was working on a movie as well, and I had the privilege of receiving an early copy of the movie. I've watched it several times and I highly recommend it. Not only does it recap Michael's journey, it also provides some really great video for learning to run barefoot properly and safely. 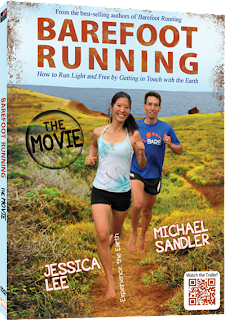 Add to that the fact that it is filmed in such a beautiful setting (Hawaii), and with co-author Jessica Lee, and you have a great movie that every barefoot/minimalist runner should have on their shelf. So here is your chance to grab a copy! Thank you Michael Sandler! I have to admit, I do love running huaraches. 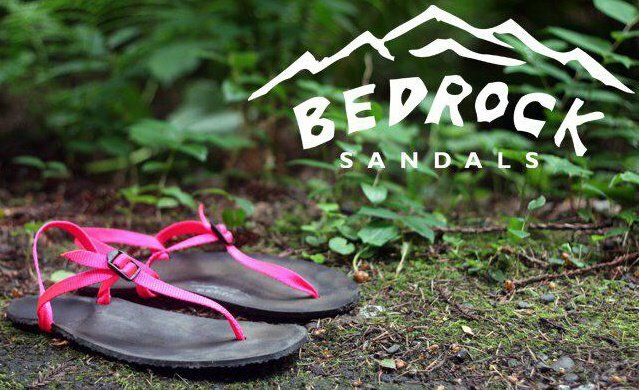 I've reviewed a number of different brands and styles, and Bedrock Sandals are still one of my favorites. I reviewed the Bedrock Earthquakes earlier this year, and since that time, there have been a number of improvements and enhancements, due to the intense focus on quality and performance by the dudes at Bedrock. Thanks to the generosity of Dan and Nick at Bedrock, you too can own a pair of the latest Earthquake V2's!! When it comes to running solo (as I do primarily), safety and security is critical. I know my wife was much happier once I started running with a RoadID earlier this year. 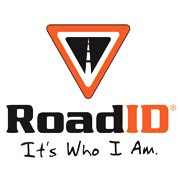 Carrying your critical emergency info is a simple and smart thing to do, and RoadID makes it easy and stylish. Earlier this year I was running with the Wrist ID Sport. I liked this band for it's comfort and simplicity. Unfortunately, I lost it somewhere along my travels, and the few times I ran without it, I felt uncomfortable not having it on. So, I have since replaced it with the Wrist ID Elite model. I really like the watch band type clasp, and the smooth rubber material of the band. 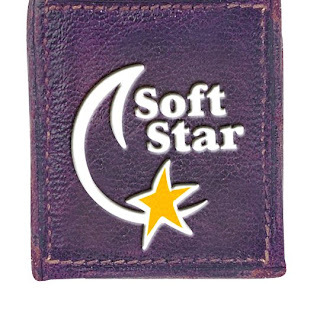 It is easy to clean, and comfortable to wear. Regardless of the style, RoadID has you covered. Ok... back to huaraches! 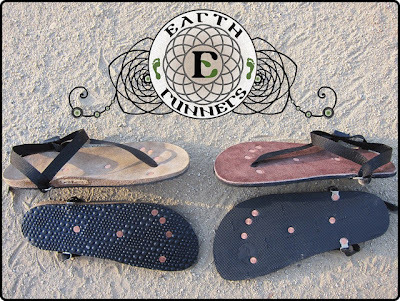 Earthrunners is a new company that got a terrific start last year via Kickstarter. Their twist on the running huarache is the addition of conductive copper studs to complete a grounded connection with the earth. I tested out the Quantum trail running model. What was unique in these huaraches was the sueded leather footbed over a cork and rubber sole. Very comfortable! Michael at Earthrunners has graciously offered a pair of sandals to one winner, which is awesome. Thanks Michael! So, get entering below!! Although Tribesports doesn't necessarily have any "product" to give away (their service is free! ), I would be remiss if I didn't give them a shout out. When I was first introduced to the site, I didn't think I needed another social media site to participate in, but I've really grown to love this site, the challenges, and the tribes of amazing people there! As I noted in my review here, Tribesports covers the world, and I've met a lot of folks from many different countries that share the same passion for sports and fitness. And I love all of the great challenges, including team challenges such as the Elves versus Reindeers in total mileage run between 12/1 and 12/24. It came down to the wire with each team racking up close to 9,000 KM! Anyway, I think it's a great site, especially if you are a little competitive. I'm happy to say that I've just brought my ranking into the top 750 users out of over 100,000 users on the site! Here's a little sample of a great article and challenge from the site... check it out, and I hope to see you there! Click here to read the article and see the challenge!! Looking for the simplicity and freedom of a huarache, but in a shoe form? Look no further.. the Elves at Soft Star make some amazing shoes! I was fortunate enough to test out the Runamoc Dash Lites from Soft Star earlier this year. I really love the soft leather moccasin styling and comfort of these shoes, tied with a minimal 5mm sole that performs really well... and a very comfortable trail shoe as well. All hand made by the Elves in beautiful Corvallis, Oregon. To help you out in getting started in your own pair of SoftStars, the head elf has authorized a $25 gift certificate to one lucky winner! What can I say? I feel truly blessed to live in such a beautiful part of the country where we get to gaze at "America's Mountain", Pikes Peak every day. 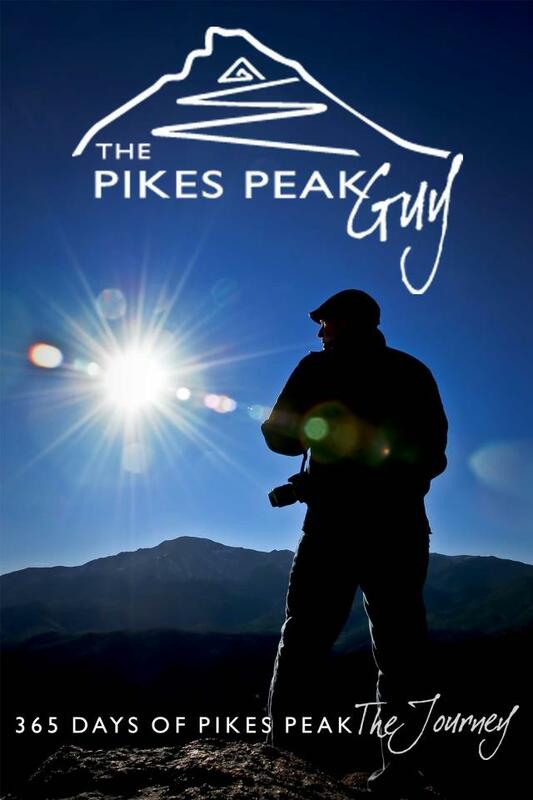 My friend The Pikes Peak Guy loves the Peak so much that he set out on an amazing journey to photograph the Peak every day for a year, and he did it without missing a beat, and enjoying some amazing experiences along the way. I interviewed The PPG back in July, and you can read much more by clicking here. If you aren't lucky enough to enjoy a view of the Peak everyday, The PPG is giving you a chance to enjoy an autographed soft-cover version of his amazing book! 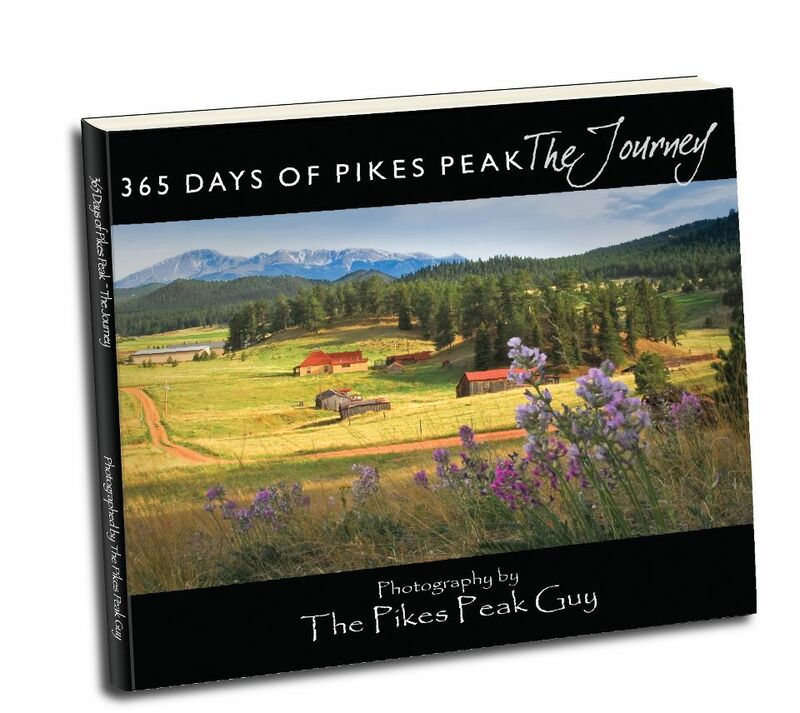 Not only is it full of a full year of amazing photos, but along with it comes all the great stories of this journey, as well as feedback from fans that followed his project on Facebook. It's an awesome book... good luck!! Ok.... I have a pair of custom "J"uaraches from Muddy J that I am going to be working up a review on soon, however I haven't been able to get out and run in them!! They are the first and only huaraches I've tried with a 100% leather sole, and a unique design. So far, wearing them around the house has been awesome! As you can see, Muddy J puts a lot of love into his craftsmanship.. I loved the embossed strap across the top and the unique serial # embossed on the sole. These are unique in that they are custom molding to my feet all around as I continue to wear them, and the reflective elastic lacing is really cool. Incline Addicted.... love it! Anyway, I really excited to add Muddy J to my list of giveaways. One lucky winner will get a custom built pair of "J"uaraches! The winner will need to pay shipping of ~$10, but that is a bargain for some super cool sandals... Look for my full review very soon! Last, but certainly not least! is Luna Sandals out of Seattle, WA. Luna was started by Barefoot Ted of "Born to Run" fame. 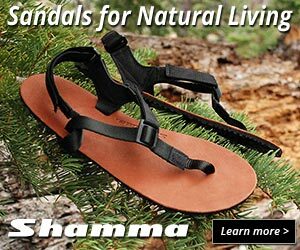 Luna Sandals are considered some of the best trail running sandals on the market. I was more than happy to test and review the Luna Leadvilles with MGT earlier this year. The Leadvilles are probably one of the most rugged huaraches I tested (10mm base), but super comfortable and performed well on the most harsh trails. Also, they performed really great in deep muddy water! 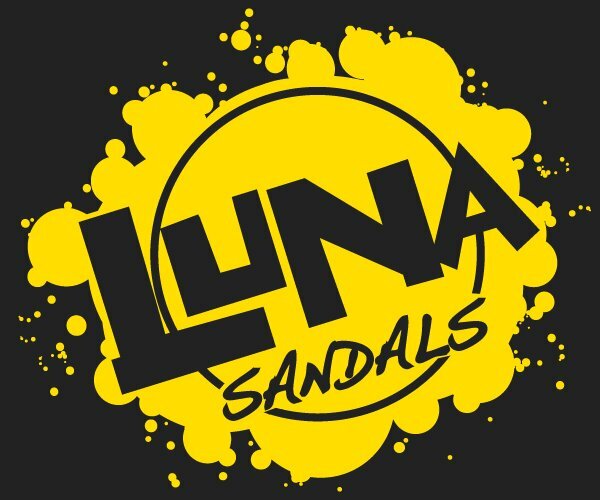 To get you started off on the right foot in 2013 (or left for that matter), Luna Sandals will provide one winner a $50 gift certificate good towards the purchase of a DIY Sandal Kit. For whoever wins this, I would love to see your finished sandals in action! Wow... ok there you have it. A TON of awesome stuff! Good luck to you all, and I wish you a Happy and Healthy 2013!! Thanks again for following... 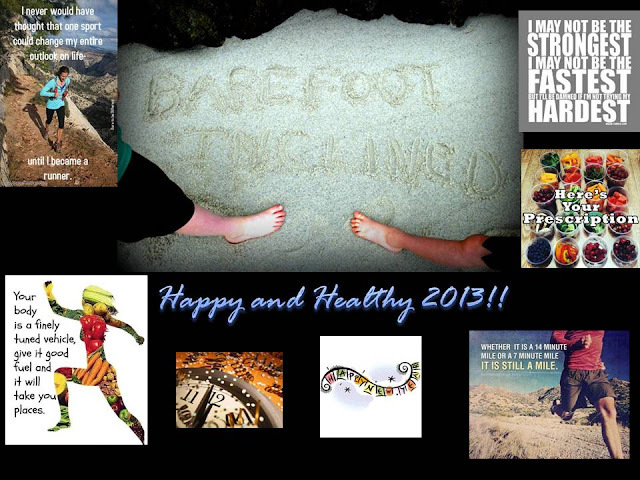 I look forward to another great year of running/blogging and getting healthier!